Baby Wear by Claire﻿ sent my two very lucky children one each of their products to review, as you can see from the photos, they are both extremely happy. This wonderful facebook page has a variety of Crocheted hats and bands with your own personal touch, as well as bandana dribble bibs and matching taggie blankies. The thing I love about these products is that they are pretty unique, and because they can be personalised, meaning you will not have a headband the same as anyone else. I chose a Jungle fleece on one side of Tyrus's bandana bib and a Pirate Stripe on the reverse. Eowyn is a real girlie girl and adores headbands and clips, in fact she is always raiding her two big sister's jewellery and hair boxes for goodies. I chose a bright pink band with a great big flower and she loves it. Her two sisters also showed great interest in the band until she told them quite clearly it was hers! I would definitely recommend these products and they are very reasonable﻿, there is also free P&P for orders placed today or tomorrow. Many Christmas goodies on the way, so head over and take a look NOW ! Neva with the Bizu ! The lovely people at Blog Match and Spinmaster gave us the amazing opportunity to review the fantastic Bizu. And it certainly didn't disappoint! It says that it is from 6+ years and this was the perfect thing for Neva aged 8 to have, although her older sister aged 13 enjoyed making them too! TheStyle Studio was very easy to assemble and the pieces fitted in quite easily, the only problem Neva had was deciding which charms went in which compartment. The Kit comes with four different animals to make, although there is room for many more. The Bizu Beading Tool fits in the top of the Style Dial, and allows you to twist the unit and the pieces that you require drop to the bottom of the base. Each bracelet requires 1 head, 1 charm, 1 torso, 4 legs, 1 tail and 1 clasp/elastic. It is extremely clever the way the tool fixes to the elastic and allows the pieces to be threaded on. A super duper cute little pet. This set is perfect for little girls like Ne﻿va, that love jewellery and adore animals. I think this will definitely be on lots of little girls' Christmas Lists, and I am sure Neva will request extra sets to expand her collection. The quality of the bib is amazing and it is so soft, perfect for catching that chin full of dribble. The bibs are not too bulky and Tyrus is perfectly happy wearing it, as can be seen from the photo above! The backing is a lovely breathable micro fleece, meaning the bib is very light and the moisture is taken away from his delicate skin - although trying to get the moisture out of his rather impressive double chin is another matter! Also check out their facebook page, they have wonderful giveaways. Red Toolbox is a new and innovative concept of woodworking for kids offering parents and children the opportunity to spend quality time together while learning new skills. 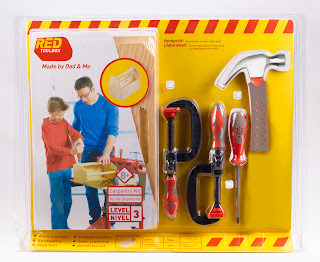 The world of Red Toolbox includes a wide variety of specially designed tools and kids woodworking kits that let them explore and create woodworking for kids projects with their parents. Families enjoy valuable team time while building unique kids woodworking projects designed with the kids in mind. Now the whole family can share the fun of woodworking together! The wonderful people at Red Toolbox have very kindly given me a set of tools and Classic Toolbox. Product Description: Store and carry all your tools in this Classic Toolbox. Sturdy, easy-to-carry handle makes it fun to take with you! Our household LOVES to bake, especially sweet things, although as you can imagine in a family of eight, spare time is at a minimum. Don't get me wrong, I would love to spend hours baking, but I just never seem to have the time. 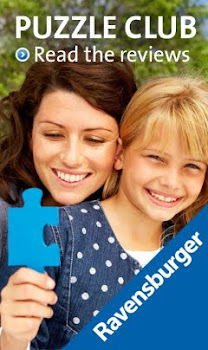 So I am always looking for a quicker alternative that will achieve the same results but in less time. Last weekend, whilst Asa was away playing Rugby, the children and I had a baking day, with many thanks going to Greens. We were sent numerous cake mixes to have a go with and the children were very excited. Neva and Eowyn had a go at making Barbie Vanilla Cupcakes, Lochie baked the Dennis The Menace Chocolate Cakes, Kaide was very excited about the Thomas Vanilla Cakes and Xene was delighted to be able to test the new Strawberry Cupcakes..
All of the mixes had easy to follow instructions, the Barbie and Strawberry Cupcakes, used butter icing, the others were just water icing. All required at least one egg, which is never a problem in this house, as we have eight free range chickens the only problem they had was deciding which chicken's egg they would use! They took very little time to cook, and whilst the younger ones were waiting, they had great fun with the activity book and stickers that are included within the cake mix packets. Xene really enjoyed the Cupcake Mix, which requires you to add jam in the middle, once they are cooked and prior to the icing being added. The kit also includes a piping bag and nozzle which Xene enjoyed using. The new Cupcakes also come in Blueberry and Lemon flavours too. · It is sugar, alcohol and colourant free, as well as value for money, as it contains up to 100 doses (rsp £4.20 for 50ml dropper). The wonderful people at Blog-Match have joined forces with Tactic Games to enable us very fortunate bloggers an oportunity to review some fabulous games. 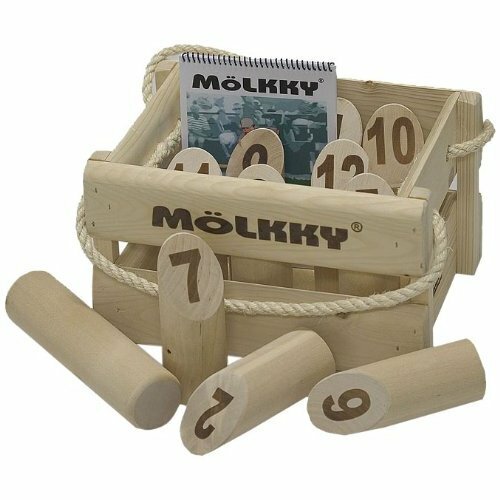 Molkky – the best selling outdoor family game from Finland! Tactic Games is backing family fresh air fun this year with the launch of Molkky. Already a craze in Finland, Molkky is made from wood from replenishable forests. Molkky is an eco-friendly toy with both minimal packaging and minimal air miles to the UK. Outdoor fun for all the family is what has made Molkky an instant hit. 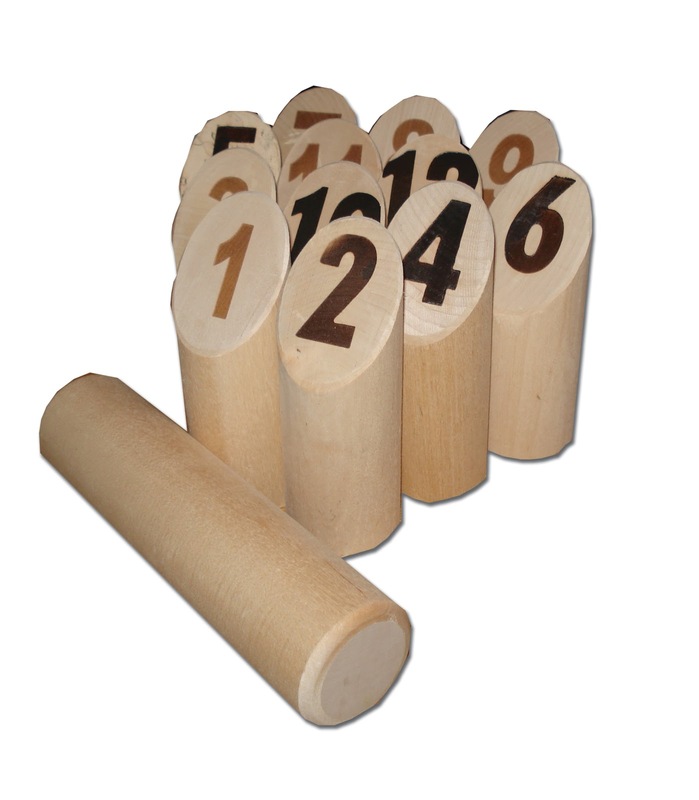 The rules are simple with the first player to knock down 50 points worth of skittles using the wooden throwing pin becoming the winner. The secret of Molkky’s success is the fact it can be played on many levels with a variety of skills and strategy, ensuring mum and dad can happily play along with the teenagers, in fact, even the youngest member of the family can master Molkky! Tactic Games also has giant versions of Yatzy, Giant Tower and the lively Ten Sticks on a Board, all made from replenishable wood and ideal for family games in the sunshine! This looks a really fantastic game that would certainly go down well with the whole Morrison clan, all of the children love being outdoors, so I think this one will definitely be making its way into our outdoor games list of buys. 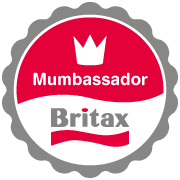 Congratulations, could you please send your details to me at mandijmorrison@aol.com, I will arrange for these to be sent out to you. So, on Friday morning I took Eowyn to Clarks for a fitting, when she was measured at the end of July she was a size 5, so imagine my surprise when she was now a 6.5! A whole 1.5 sizes in two months! 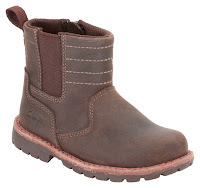 I wasn't too sure which shoes to get Eowyn, as she technically now had no shoes that fitted her, so the very helpful assistant went upstairs to the store room and brought down a selection of shoes, boots and even some wellies in the correct size. We have numerous pairs of wellies in the house, so these were discarded. 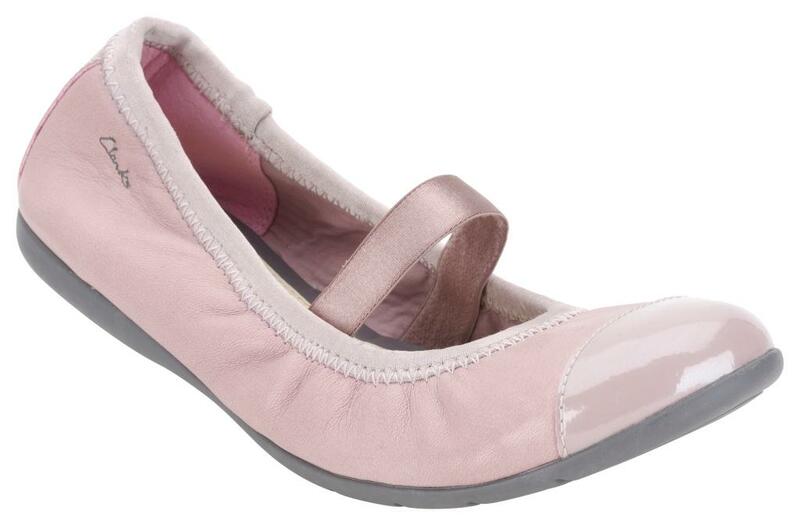 The first pair she tried on were a bright pink pair of shoes, that were incredibly soft and very light. They fitted Eowyn perfectly and she proceeded to prance in front of the mirror, showing approving looks. Next out of the box was a pair of lovely Purple Ankle boots, we tried this on, as Eowyn adores Purple, although I am not a big purple fan, these were in fact quite subtle and were not the colour of the shoes on the poster in the shop! 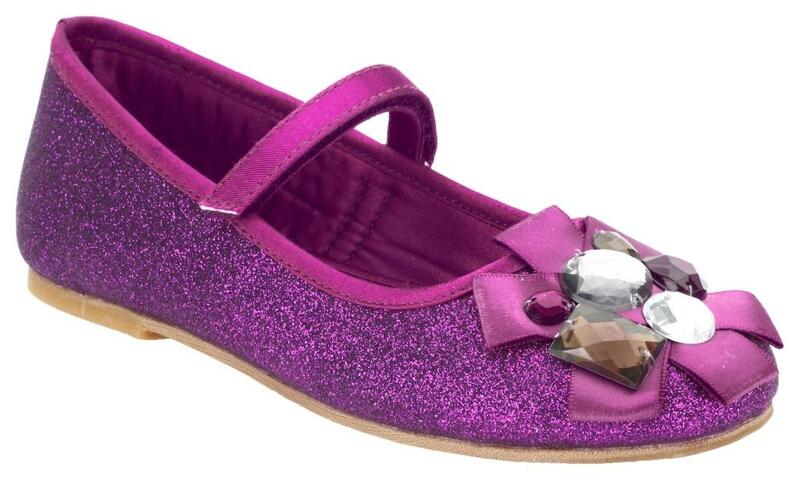 On closer inspection we decided that although Eowyn had measured a size F fitting, her little toe felt cramped, so the assistant returned with a size G and these were a perfect fit, they also did them in a fuschia pink, but Eowyn was adamant it was to be purple ones. As you can see from the photo below Eowyn really did have a hard choice deciding on which footwear to choose﻿, there were so many lovely styles and colours that it made deciding very difficult. 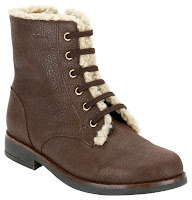 All the weather reports are pointing towards a harsh winter, so I decided that we probably should get some winter boots, to be prepared. We both fell in love with the brown Zannia boot with Gore Tex, which means they are both waterproof and breathable. 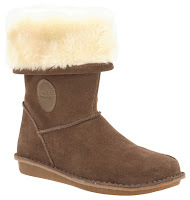 Eowyn tried them on and took a lot of persuasion to take them off, and kept asking me when it was going to Snow! They felt lovely and are definitely a good investment, with the added bonus that Eowyn was able to take them on and off herself. 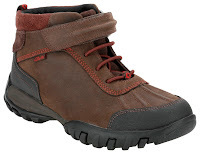 The range of shoes and Boots that were available was amazing, especially as the Clarks we visited is only a small shop, the staff were helpful and attentive, if there was a shoe we liked the look of, but it wasn't in store they were happy to order it in. Manny steps right out of your favourite show and comes to life in your hands with this fun, articulated plastic figure. You can take Handy Manny anywhere you go to find an adventure to fix something! This Handy Manny figure comes complete with all 7 of his tool friends which he can clip to his tool belt or store away in his signature tool box - just like in the show. To celebrate achieving 500 fans on facebook, I have this fantastic toy to give away, perfect for any little boy or girl for Christmas, although I have 500 on facebook, I do not have quite so many blog followers. Earth Friendly Baby products are definitely a hit in this house, you can check out the review here. 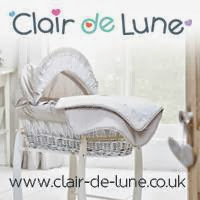 And now you have the chance to win some fabulous Earth Friendly Baby Products. ~ Head over to Earth Friendly Baby and then return here and comment below which is your favourite product. On Friday I am going to be attempting to take Eowyn shoe shopping. I kitted out the four older children before they went back to school, but to be honest Eowyn has been in her Sandals since the beginning of the Summer Holidays, and with such lovely weather we have been having, she has been Ok, but with the weather reports predicting that it is going to get much colder, I think it is time we went for the Autumn Winter footwear. Footwear is one area that I don't mind paying that little extra for, because I think it is important to ensure they have good fitting shoes, the girls can squeeze themselves into narrow shoes with 6" heels when they get older ! So Eowyn and I have our appointment booked for 10am on Friday to go and get new winter shoes or boots, we shall let you know how we get on, fingers crossed she is in a co-operative mood. I shall take photos and report back....I just hope we can decide, there are quite a few I like the look of, it will be interesting to see if Eowyn and I can agree on a pair! Giant Party Fancy Dress and Giveaway. This year I decided to get ready for Halloween early, as mentioned in my previous post Asa and I are all sorted for our Rugby Halloween Party. That just leaves the children, the four younger children are fine because they have a choice of numerous costumes that we have purchased over the years, and for just an hour Trick Or Treating they will be fine. However xene and Lochie are attending two other events, one at a theme park that is Fancy Dress, so a mass group are going as Harry Potter characters, so Xene has been told she bears a striking resemblance to Luna Lovegood and Lochie as Draco Malfoy, not too bad, although I am still hunting for the elusive Radish earrings! Another event is at an adventure place, which has a lot of swings, ropes and slides, so nothing too restrictive, the lovely people at Giant Party have sent Xene a fantastic Skeleton outfit, consisting of a one piece, tutu dress, which will be perfect to add with leggings and some skeleton tights, not forgetting my black and purple wig! Next was Lochlan, who was sent a Zombie Making Kit, complete with Latex and fake blood! Below is our step by step of this fantastic Kit. 1. Cover Lochie in White! As you can see we need a little more practice, but it was really great fun and Lochie loved it. If you would like to dress as a Zombie this Halloween, then this giveaway is perfect for you. To enter this spooky giveaway, please visit Giant party and return here to tell me which outfit you would dress up as.